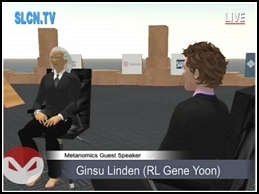 Gene Yoon, Linden Lab’s former General Counsel and current Vice President of Business Affairs, spoke in Second Life yesterday as part of the Metanomics / Metaversed series of events, hosted by Cornell’s Robert Bloomfield. SLCN has made a video of the event available. Yoon focuses on economic policy in virtual worlds, not legal issues, but obviously, there’s a lot of crossover. The discussion quickly turns from macro to microeconomics, because Yoon refers to the Linden Dollar “a product” and encourages users not to think of the world as possessing an economy. Throughout the discussion, he consistently discourages the use of terms like “monetary policy” and “macroeconomics” in reference to Second Life. Bloomfield pushes the macroeconomic angle, while Yoon wants to draw a line between the user experience, where he says metaphors regarding “economics” and “ownership” do apply, and the business and legal world, where he says the metaphors are largely invalid. His comments will almost certainly be controversial. Yoon and Bloomfield also discuss micropayments, intellectual property rights, alternative dispute resolution, Linden Lab’s relatively laissez-faire policies, competition for Second Life, and more. This is off topic a bit, but I want to compliment Robert Bloomfield’s Metanomics series, and Nick Wilson’s Metaversed site generally, because they are becoming my favorite source for serious business and economic discussions about metaverse issues. The speaker series is outstanding, and Metaversed is rapidly turning into a business counterpart to Terra Nova. I have to say that I generally find podcasts, interviews, presentations, and the like that focus on serious issues to be waste of time; it’s just faster to read research papers. So I was a little reluctant to dive to these. But the Metanomics series, which started out strong, has only been getting better. Recently, they’ve started taking on the feel of a high-quality PBS interview show, from the brief mention of underwriters at the beginning through the fairly academic and respectful pace that Bloomfield sets. Picture Charlie Rose talking to Alan Greenspan. Bloomfield isn’t attacking his guests (to the occasional disappointment of the Second Life audience) but he shouldn’t be; a good interviewer knows that evasive answers tell smart viewers a lot, and Bloomfield does a good job pointing them out without antagonizing his guests. It’s a fine line, but it works, and the format lets Bloomfield get guests like Yoon and ‘Anshe Chung,’ who don’t often make public appearances. Wilson has recently made significant cosmetic improvements to the main venue that these are held in as well, and more importantly, has involved a number of partner sims, allowing more residents to participate in the live discussions. He has also been proactive in keeping the audience free of griefers and eliminating problems before they get out of hand. The series is well attended and the backchat is great, but if your schedule doesn’t let you make these live, watching them on SLCN later (or even just listening to them while making dinner, as I often do) is a good substitute. Gene’s a great guy, but trying to call the L$ a product, and not a currency, seems somewhat disingenuous. It is the Linden Dollars, after all, and not the Linden Widget. On the community page, I believe it says, “Economy Statistics”, not “Product Statistics.” After trying to get us to think about the L$ as a viable currency, is Linden Lab suddenly changing their mind? I don’t quite get it, beyond the legal angle. Linden Lab walks awfully close to the edge with their “metaphors” and I wish they’d just either just reject or embrace a real cash economy and be done with it. Either position works, but they have to pick one. Look at Entropia — for better or worse, they don’t mess around. It’s cash. They’ll cash you out if you leave. You can sue them (albeit in Sweden) if they don’t. By all reports, it is damn near impossible to make any money in Entropia, but at least they’re intellectually honest. finally the reality of the virtual has been made clear by an adult at linden lab. never your world, always your work, and now others money. maybe finally the end of this year of metanonsence and the rss fed blog . As a successful entrepreneur in many brick and mortar enteprises, the response by Yoon are as transparent to me as many of the boardroom discussions I have participated in over the course of my career. Primarily contractual negotiations. It’s called CYA. I am reminded of the insurgange of “Dot Com’s” in the mid ’80′s. Eyeballs were at a premium. Thats what LL is dealing in here “Eyeballs”. However, just as in the early days of Web 1.0, quantifying the value of said presence comes with a responsibilty to define and renumerate. It’s a bit like brokering the “Force” of Star Wars fame. It’s all around you, flows through you and has a definitive result to those Jedi who are adept enough to utilize its potential. But try and pitch it to ConAgra or Proctor and Gamble. There is but one exit strategy here IMHO. Open Source. Need I remind anyone that LL has never brought one Corporate presence to Second Life. LL did not create the vibrant economy. Every issue to date (btw, today is my 4 year SL birthday) has been dealt with knee-jerk retroaction. Second Life is by no means the first successful Virtual World. It is however the first that puts the reigns of content in the hands of its residents. Content is King. It has a definitive value. It has been marketed as a commodity in every platform I have ever been associated with. And they are many. One could easily make the argument that User created Content is being “taxed” by LL. These “taxes” come in the form of upload fee’s and Lindex exchange fee’s and tier payments. Personally, I prefer a “hands off” approach in governance matters. I am a dyed in the wool capitalist. I make no bones about it. We need faster severs, we need critical support as well as sustained growth. These are not passive matters. They require considerable capital expense and resources. This is where LL should focus their attention. You cannot do that with “smoke and mirrors”. It all comes down to liability in my view. I do not envy anyone who has to deal with the issues that we have all been confronted with in a global economy. The web IS a global economy. International regulations, Adult Content, Gambling, Taxation and Litigation have impacted everyone to some degree who maintains a commercial prescence on the internet. In the chaotic soup we claim as the metaverse, these issues have a predominant effect on everyone’s bottom line. Whether you are a parent or a producer. I recently was given the link to an article concerning what is now the largest Adult Website (accordining to Alexa) on the web. It is all user generated content. The creators have been unsuccessful to date in marketing their product to any of the mega-conglomerate moguls in the industry. Why? No one wants to deal with the compliance and regulatory issues that come with user created content (particularly adult). I drank the PhilipBerry KoolAid. I was willing to invest in a “partnership” with a company lacking a Mission Statement. In recent days I find myself wondering if indeed said “KoolAid” wasnt actually “Snake Oil”. Thanks for the in-depth comment, Stroker. You’ve hit the nail on the head here. I’m finishing a chapter in Virtual Law today that covers virtual property, currency, and land, and I keep finding myself coming back around to the idea that there are many legitimate ways to handle these questions, ranging from acknowledging “virtual property” and giving users complete ownership all the way to holding every byte of data entirely as a corporate asset. The problem isn’t just how you approach it — which can be all of the map, and still be fair — but in being consistent in your approach and the way you articulate it. Basically, if the front page says you can “own virtual land” and “make real money” the TOS better agree with that, even if you do have to break some game traditions to do it. And you really better not decide to start drawing these lines closer and closer to your side of the table after four years of operation — during which you’ve been encouraging people to make their real life careers in your space. i too make money in SL and only came to it last year- after 10 years of running other vr worlds for profit, WHEN there was enough buyers for my sellings. REAL money. I questioned the obvious TOD issues dealign with our IP, the obvious problems of back up and control of our property when “offered via LL services” etc. Strokers a realist. thank god for a few of them. much needed. just fyi– web bubble 1990s….. desktop publsishing bubble -80s. open source is a total lie for content makers…..thats why its spoken here of as some holy grail, mainly by IT and programmers of software tools NOT content services.